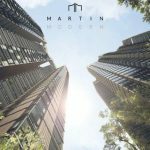 The Robin Suites is a magnificent freehold residential development developed in Singapore and which was launched back in 2013, by Robin 25 PTE Ltd which is among the renowned development agencies in Singapore. The T.O.P for this building is expected to be reached by December 2016. It is nestled in a serene and lovely neighbourhood in Singapore's prestigious District 10 area. This residential complex is located conveniently and is accessible from any side of the city. It is will served by a number of transport lines. Several MRT stations are located nearby such as Stevens MRT and Newton MRT. For bus lovers, they will be pleased to know that a number of bus services ply the route. For those with vehicles, they can make use of The River Valley Road system, Central Expressway, and Pan Island Expressways. All these servers offer residents at Robin suites easy access to and from the Central Business District. A number of shopping centers are located nearby where residents can get to do their shopping conveniently. The Ion Orchard, Wisma Atria, Paragon Mall, and Takashimaya Shopping Mall are some of the one-stop centers located around. They are one stop shops meaning residents can get all they want under one roof. Other amenities around include groceries such as Tanglin Market Place and Gourmet Grocer where residents can be treated to fresh groceries. Others include eateries, cinemas, banks and supermarkets. Education wise, parents at Robin Suites will not have to worry about their children’s school life. There are a number of well-established schools that are located nearby. These include Raffles Girls School, Singapore Chinese Girls School, Anglo-Chinese School, St. Joseph's Institution among others. They all offer great and quality education of the highest standards. Read on more Freehold developments by visiting Trilive @ Kovan in District 19, The Asana in District 10 and The Meyerise in District 15. The Robin Suites Singapore is giving extra discount for the limited units now. Price from S$16xx Psf, so do not miss. Please contact us for price list and more information. Please see attached image for comparison of prices including Robin Residences and more developments nearby.